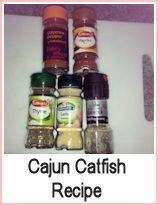 Here's a couple of cat fish recipes to get your taste buds going. Cat fish is sometimes called rock salmon. These recipes would be equally good using any white fish - your catch of the day for instance. They're both one-pot stew type recipes that are easy to cook either at home or on a camp stove. Just add some fresh crusty bread to mop up the juices and you've got an excellent meal for the family. 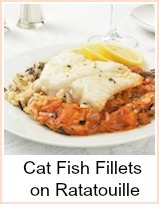 For further cat fish recipes, there are links at the bottom of this page. Heat the oil in a flameproof casserole dish and quickly seal the cat fish - this way, when you add it to the liquid, it won't disintegrate. Remove with a slotted spoon and put to one side. Fry the onion until softened, add the potatoes and just turn them over to coat. Add the water and milk and simmer for about 10 minutes. Add the broccoli and simmer a further 5 minutes. At this point, test that the potatoes are nearly cooked - if not, give the stew another 5 minutes. Add the sweetcorn and cat fish and simmer a further 5 minutes until the fish is cooked. Season to taste and add the parsley. 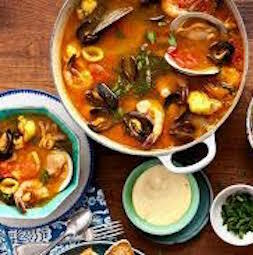 The second of my cat fish recipes is really lovely - a mixed mediterranean stew. Heat the oil in a flameproof casserole and quickly seal the cat fish chunks - remove with a slotted spoon and keep to one side. Add the basil, cayenne, tomatoes, stock and wine and simmer for about 15 minutes. 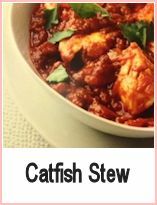 Add the cat fish and simmer for about 5 minutes. Add the mussels and prawns and simmer for a couple of minutes, until the mussels have opened - discard any that have not opened after 2 minutes. Add the parsley or basil and serve with crusty bread. Two great cat fish stews - one with broccoli and one Italian style with tomatoes and mussels.